We've blogged before about whether the still-controversial doctrine of joint criminal enterprise (JCE), in its three manifestations, can be charged before the Extraordinary Chambers in the Courts of Cambodia (ECCC). As we've discussed, the same question was posed in the Duch case, although the Court determined that the issue was not properly raised at the investigative stage, so the defendant could not be charged under this theory of liability. Did the doctrine exist in customary international law during the Khmer Rouge era (1975-79)? 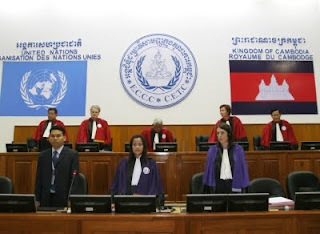 The Pre-Trial Chamber (in red at left) comprising President Prak Kimsan, Ney Thol, and Pen Pichsaly (all from Cambodia, surnames listed first), along with Judges Rowan Downing (Australia) and Catherine Marchi-Uhel (France), has now ruled on the issue. The decision arose out of the defendants' appeals of the order of the Co-Investigating Judges confirming that the JCE doctrine was properly pleaded by the Co-Prosecutors, that the JCE doctrine existed in customary international law at the applicable time, and that it may be charged before the ECCC. In its opinion, the Pre-Trial Chamber sustained most of the order of the Co-Investigating Judges; however, it split the proverbial baby in terms of the three forms of JCE by rejecting the most expansive form of the doctrine. By way of background, JCE is traditionally conceived of as encompassing three overlapping forms. ►The first (“basic”) mode provides for liability where an individual intentionally acts collectively with others to commit international crimes pursuant to a common plan. ► The second (“systemic”) form provides for liability for individuals who contribute to the maintenance or essential functions of a criminal institution or system, such as a concentration or detention camp. ► The third, and most controversial form, provides for extended liability, not only for crimes intentionally committed pursuant to the common design, but also for crimes that were the natural and foreseeable consequence of implementing the common design. the contribution (surpassing some threshold) by the defendant to the execution of the common plan (para. 38). JCE I requires proof of a shared intent to further the enterprise. JCE II, as a subset of JCE I, adds the requirement that the defendant be aware of the system of ill-treatment. JCE III finds analogies in the Pinkerton doctrine by allowing members of the JCE to be found guilty of extraneous crimes where the defendants foresaw, and willingly took the risk, that such crimes may occur (para. 39). In reviewing the reasoning and sources of law relied upon by the Co-Investigating Judges, the Pre-Trial Chamer confirmed that post-World War II case law, early work by the International Law Commission on the Draft Code of Offenses Against the Peace & Security of Mankind, and national case law on the common purpose and co-perpetration doctrines all establish that a notion of JCE I and II liability would have been sufficiently accessible and foreseeable to the defendants in 1975. By contrast, the Pre-Trial Chamber ruled that the sources reviewed by the Co-Investigating Judges (and the other ad hoc tribunals to consider the issue) do not provide sufficient evidence of consistent state practice or opinio juris with respect to JCE III at the times relevant to Case 002 (para. 77). The two international instruments relied upon by the International Criminal Tribunal for the former Yugoslavia in the Tadić case to establish the provenance of JCE III — the Terrorist Bombing Convention and the Rome Statute of the International Criminal Court — were not yet in existence during the Khmer Rouge era. To the extent there were relevant WWII-era cases, such as the Borkum Island or Essen Lynching cases, the Pre-Trial Chamber determined that those case lacked a reasoned judgment clearly showing the basis of liability relied upon. In addition, the Pre-Trial Chamber rejected the argument that most, if not all, countries had adopted some notion of extended common purpose doctrine holding someone liable for unintended but foreseeable crimes outside of the common plan (paras. 86-87). Indeed, Cambodian law itself would not have given noted to the defendants that they might be liable for such crimes. This ruling has the potential to limit the extent to which the regime leaders can be charged with much of the harm that befell the Cambodian populace during the Khmer Rouge era. While thousands of individuals were detained, tortured and executed in this period, many more died of starvation and overwork due to the radical collectivist and agrarian policies adopted by the Khmer Rouge leadership. Whether it can be shown that the defendants intended these deaths depends on the strength of the Co-Prosecutors' evidence.